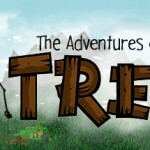 Idle Wood Tycoon is a fun semi-idle game. It involves a lot of clicking, at least in the first location, or a lot of waiting, but it is still a very enjoyable game. Download the game from the Play Store, and continue reading for the guide! Check out the bottom of this post for similar games! There are a few different tabs/screens in this game. The main tab that you will be on is the overview tab. 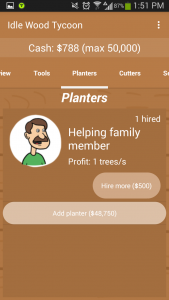 This is where you can tap for resources, see how much you get per click, see how much you get automatically, see your location bonus, tree value, and how much is in your storages. All these features will be gone into more depth further in this guide. Tapping to plant, cut, and sell will be the main way to make money in the starting and mid stages of the game. You need to plant a sapling, which gives you trees, then you can cut down the tree, which gives you wood, which you can sell to get cash. The numbers on the buttons is how many of the respective item that you will plant, cut or sell per click of the button. The number to the right of the button is how many of the respective item will be planted, cut, or sold by the automatic workers, and this is measured in tree/wood/cash per second. You can upgrade there on the other tabs/pages of the app. The numbers at the top is how many of that item you currently have, with the max number being the max amount you can currently have. You can upgrade your storage to hold more items of each kind also on another tab of the app. Tools are how you upgrade the amount you earn per click. These can be upgraded until a certain amount, and then you have the max tools. Maxing out the tools gives an achievement in Play Games. At the start of the fastest way to get money is to tap, so upgrading the tools as soon as possible is the best way to progress through this game. In the later stages of the game, is is still a good idea to buy the tools as fast as possible, but you will also want to buy workers soon. workers are not as helpful in the early stages, but you should still buy them to make money while you are offline or not clicking. The best course of action with the tools is to buy the planting tool first, then the cutting tool, and then the selling tool. Buying new tools and clicking with them will quickly fill up the storage, so that should be upgraded often as well, which will be talked about in the storage section of this guide. Planters, Cutter, and Sellers work together to earn you cash without clicking and while you are offline. You can either upgrade one of them, or buy a new one. 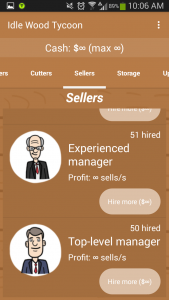 You can buy a total of 13 managers/members of each planters, cutters, or sellers. You can buy over 50 of each manager/member of each as well. The managers farther down the list usually are a better deal to buy more of, at least at the start of the game. Later on in the game, you will only really need to buy the first one or two members and hire as many of them as you can, as this will be enough to progress farther in the game, but that is only after the first reset. In the beginning, you will need to add as many as you can, and hire the ones that give you the best bang for their buck. They start off being much less valuable than just clicking, but they work for you while you are clicking, and while you are offline, so they are a very good investment to buy early, because that way they will get you more cash in the long run. 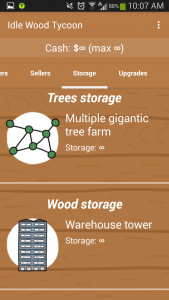 To start the game, you will get 50,000 storage of each trees, wood, and cash. You will soon need to upgrade this to progress in the game. 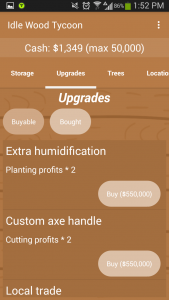 The cash storage should always be upgraded first, so you have enough money to buy tool upgrades or any other upgrades you need to buy, and then after you start earning cash faster, you should upgrade the trees and wood storage. To upgrade the storage, it costs almost what the current max is, so you should upgrade before you hit this max cap so you are not wasting any clicks or any of your resources. Storage grows exponentially, so it will take longer to reach the later game storage unlocks than the early game ones, so be prepared for that. Many of the unlocks require more cash than your max storage will allow for, so you will need to upgrade your storage as soon as possible, as this will allow you to get even more cash, and buy more upgrades. Upgrades allow you to get cash even faster in this game. 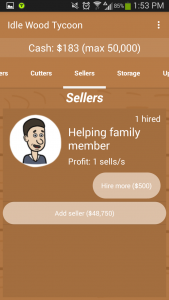 You buy multipliers for each clicking category (planting, cutting, and selling), as well as each automated worker category (planters, cutters, and sellers). You start off buying multipliers of 2 for each category, and move up to buying multipliers of 5 for each category. These are also very good to buy as soon as you have the money for them, as they making clicking and the automated workers much more effective. There are six upgrades that are all the same cost, one for each clicking and automation category, and then the price jumps to the next level. You can see the upgrades that you have not bought yet under the buyable button, and the ones you have already purchased under bought. This is a major way to advance in this game, so pay attention to this part of the game. Trees are similar to the upgrades in the previous section, but they only affect the selling price. 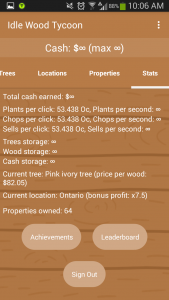 This means that it will not change the amount of trees or wood you create with each click, but it will change the amount of cash. 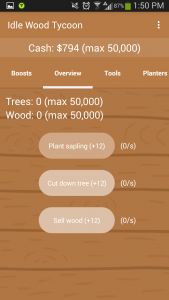 This allows you to make cash faster than you can make trees or wood, which means faster progression, as it is the cash that is the currency for buying all the upgrades and advancements in the game. 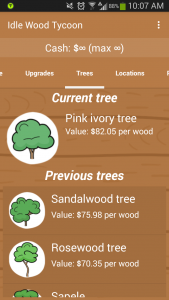 There are over 50 trees that you can buy to upgrade the amount of cash you get from selling the wood. These trees range from the starting tree the White oak at $1.00, to a Grey poplar at $7.55, and the best tree being the Pink ivory tree valued at $82.05 per wood. This means that every time you sell a wood, you get the cost of the wood as the multiplier. 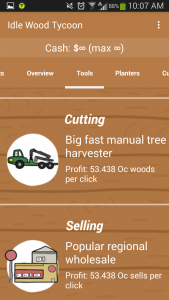 So if the cost of selling each wood is $4.40 with the White alder, and you sold 200 wood per click, instead of getting 200 cash per click, you would get 880 cash per click. This makes you cash go up much faster than your trees and wood. Locations are how you reset this game. You should buy the next location as soon as possible, because you do not get more for having more cash at a reset, but you get a flat multiplier. 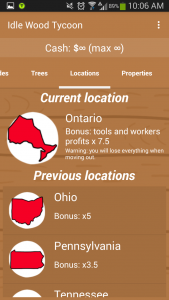 Once you get to the first reset, you should be able to get unlimited trees, wood, and cash within a few hours. Getting to the first reset might take a while, as until you get to the first reset, clicking is much more valuable than the automatic workers, so you will either have to click a great deal, or wait a solid amount of time for the automatic workers to get cash for you. The good part about this is that the app can be closed and you will still get cash. The next tab is properties, and these are pointless. They do not do anything, they just are a token of how rich you are. Once you get infinite money, you can buy as many of these properties that you want. You can have 10 sports cars, a private jet, and 3 luxury yachts, and that is just the beginning! They are only good for a number on the stats page, which is the last tab of Idle Wood Tycoon. This is a fun game that I would recommend. It is nice to be able to beat an idle game, and this one is not too long that you will lose interest, but short enough that you can beat it and not feel like you wasted your time. I enjoyed playing this game, and I especially enjoyed buying locations very quickly at the end of the game, so you will have to beat the game to get to my favorite part! If you have any questions, leave a comment and I will do my best to answer!